Well, I guess now I really am the eighth president of Bates College. It is an enormous honor and a humbling trust. Thank you Mike, Marcus, Umar, Lynn, and Danny for making it official. And thank you, Drew, for those amazingly generous words. It means the world to me that you are here. Bates President Clayton Spencer delivered her inaugural address, “Questions Worth Asking,” on Oct. 26, 2012. Click this link for a PDF version of the address. Thank you Jacqui, Michael, Pat, Jennifer, mayors Macdonald and LaBonté, and Adam for your greetings from many quarters. I am also honored to be joined today by my three predecessors — Don Harward, Elaine Hansen, and Nancy Cable. Their presence marks the fact that this ceremony is not about any given individual, but rather about the institution — its history, its values, and the mission we carry into the future. Anything we are able to accomplish in the coming years will build on the contributions you made to the fabric of this campus and college. Thank you for your leadership, and thank you for being here today. 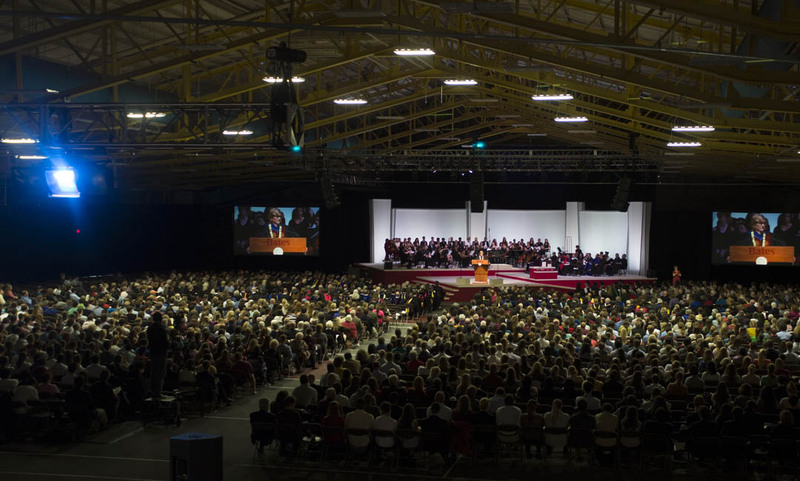 About 2,500 guests attended the installation ceremony for A. Clayton Spencer as the eighth president of Bates College on Friday, Oct. 26, 2012. Photo: Mike Bradley/Bates College. I want to welcome and thank, as well, presidents and delegates from our sister institutions in Maine, and from colleges and universities across New England, the nation, and even the Atlantic. Your presence honors Bates, and we appreciate your solidarity and support at this moment of great meaning for us. Thank you students, faculty, and staff, who are the heart and soul of this remarkable campus community. Here, I want to give special thanks to the many individuals who have knocked themselves out planning these festivities and tackling every detail so that we would all feel welcomed and well taken care of. 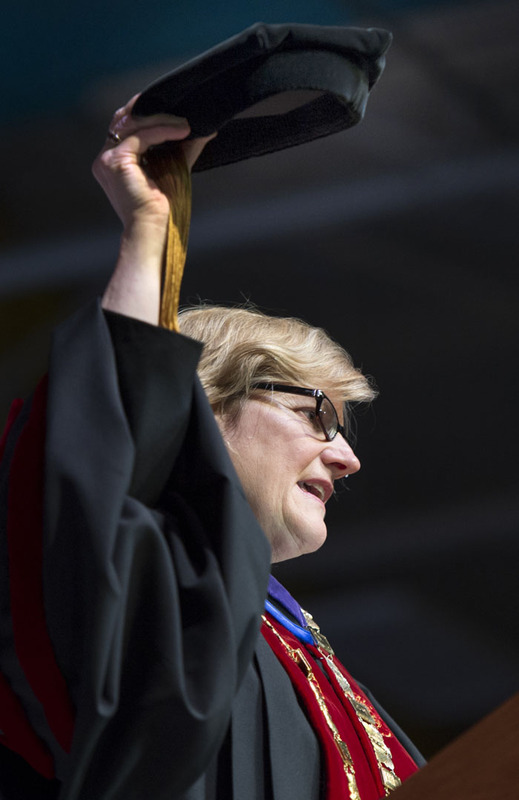 Clayton Spencer hoists the cap that her father, Samuel Reid Spencer, wore as president of Mary Baldwin College and Davidson College, during her installation ceremony as the eighth president of Bates College on Friday, Oct. 26, 2012. Photo: Mike Bradley/Bates College. Thank you, as well, trustees, former trustees, and alumni — those of you present here and those of you participating at a distance. You serve and support the college in so many ways, and we are deeply grateful. I want to give a special thanks to my friends and family who have turned up in force — my children, my parents, my brother and sister, my phalanx of relatives, and friends and colleagues from so many chapters of my life. It is such a joy to share this moment with all of you. It is a special honor for me to wear, on this occasion, the cap that my father wore throughout his academic career, including 26 years as president of two different liberal arts colleges. It is an understatement to say that my parents have made a heroic effort to travel up here to be with us today. It is characteristic of their generosity and their spirit, and I appreciate beyond measure that they are here. It is an uncommon privilege to be invited to step into the history of an institution. And it is a daunting responsibility to be asked to point the way into an inevitably uncertain future. It is worth remembering, as we try our best to look ahead and make out the shape of things to come, that our predictions are always defined more by the past we have lived than by the future we imagine. Who among us in the early 1990s would have guessed at the profound reshaping of contemporary life about to be ushered in by the Internet? And who, on September 10, 2001, would have predicted a decade defined by a “War on Terror,” U.S. involvement in two literal wars, and a fundamental recasting of America’s place in the world? When George Colby Chase was installed as the second president of Bates, he described “a society so complex that its numberless and every-varying elements with their incessant action and reaction, dizzy the clearest brain and baffle the subtlest power of analysis….” That was 1894. In 1920, on the heels of World War I — the so-called war to end all wars — our third president, Clifton Daggett Gray, spoke of the future with foreboding: “This generation has only to look at what is going on under its very eyes to realize that there is taking place in both hemispheres something, the full significance of which no one is wise enough at present to estimate, but which is bound to affect for good or ill the destinies of the whole world for centuries to come.” Little did President Gray know that the Great Depression and World War II would come along during his tenure to confirm his worst fears. Of course, at that moment, Reynolds, and Bates College, stood on the threshold of one of the most stable and prosperous half-centuries in human history — a period that we may well look back on as the golden age of higher education in America. We can never know what the future has in store for us. The best we can do is to engage the present and make our way forward with energy, diligence, and authenticity. Bates brings to this task a strong history. We are proud of our story of origin, and we tell it often. Bates was established in 1855 by Freewill Baptists, who were also abolitionists. We were coed from the beginning; we recruited freed slaves to come here after the Civil War; and we never had fraternities or sororities because they ran against our egalitarian grain. This is a good story, but like any story that we tell over and over, I worry that we may no longer hear its meaning. So I thought today I would share a slightly different story — one that is familiar in its broad outlines, but revealing to me, and I hope to you, in its particulars. As most of you probably know, one of our most distinguished graduates is Benjamin Elijah Mays, an American preacher, educator, scholar, and civil rights leader, who was president of Morehouse College in Atlanta from 1940 to 1967. Influenced by Mahatma Gandhi, he was an important mentor to Martin Luther King Jr., and an advisor to U.S. presidents Kennedy and Johnson. The youngest of eight children, Mays was born in 1894 to tenant farmers, and he grew up outside of Ninety-Six, South Carolina, in a county notorious for racial extremism. In 1917, he came to Bates as a sophomore, at age 23, after cobbling together a high school education against all odds. You see, black children in Greenwood County were allowed to attend school for only four months a year — November through February. The rest of the time they were expected to be available for farm work. Within his first eight weeks at Bates, Mays won the Sophomore Declamation Prize, and he was then recruited to join the college’s storied debate team. He graduated in 1920, one of fifteen students awarded honors, and he was chosen by his peers to be the class day speaker. Later, Mays went on to the University of Chicago, where he earned his master’s and Ph.D.
Bates admitted black students, educated women along with men, and banned exclusive social clubs not because it was the politically correct thing to do. Quite the contrary, these policies were seriously politically incorrect in their time. Rather, as the story of Benjamin Mays makes clear, we did it because, somehow, from our very beginnings, we encountered individuals in their full humanity. We took as our task educating them with intellectual rigor, ethical responsibility, and care for their fellow human beings. These qualities are in the DNA of Bates College, and they define us to this day. They also point the way forward. Bates is not MIT. And it is not our first impulse to frame our future in terms of changes in technology. Yet the technology Reif is talking about is more than a tool, it is a cultural force changing the way we live our lives and experience the world. It is reshaping our professional interactions, transforming the nature and structure of social relations, and altering our connection to information and knowledge. Some believe that the Internet will follow radio and television, bringing broad social change while leaving institutions like ours more or less unperturbed. Others point to the printing press, which made knowledge available to the masses, leading, inexorably, to the Protestant Reformation, the Enlightenment, and the modern West. One thing is certain: the context in which we do what we do in higher education has changed irrevocably. This is partly because these forces hit us where we live in higher education — some of the most powerful changes are occurring at the heart of scholarship and knowledge creation. And it is partly because the changes happening around us have altered the frame through which our particular model of education is viewed. In science, for example, online depositories allow scholarly exchange to short-circuit traditional peer review, challenging the role of scholarly journals. The Public Library of Science — PLOS — publishes open-access online journals that, in less than a decade, are among the most highly cited in biology, genetics, and medicine. Rich archives, once available only in person, are being put online. The Library of Congress has digitized historic newspapers, classic prints and photographs, as well as the correspondence of figures ranging from Alexander Graham Bell and Abraham Lincoln to Frederick Douglass and Hannah Arendt. The Google Art Project has brought online over 32,000 works by 7,200 artists, housed in 156 collections around the world. One can explore these paintings in remarkable detail — down to the individual brushstroke. These breakthroughs in technology present tremendous opportunities for places like Bates. No longer does a senior writing a history thesis have to travel to Boston to find materials or wait three weeks to get primary sources through interlibrary loan. Language students can hone their conversational style by watching foreign-language soap operas whenever it suits them on any one of their mobile devices. And our “Presidential Campaign Rhetoric” class can pore over Clinton’s convention speech, as written and as delivered. For institutions, as for individuals, the world is quite literally a click away. In their intellectual reach, then, Bates, and liberal arts colleges like us, have become a great deal larger. Yet enlarging the screen on which we must project our institutional identity and compete for faculty and students makes this tiny campus in Lewiston, Maine, look ever smaller. The liberal arts colleges, taken together, educate fewer than four percent of the college students in America. That fraction shrinks further against a large and growing global denominator. Beyond sheer numbers, what Hedley Reynolds described as the “tough-minded tradition of the small New England college” is at risk of looking dangerously quaint in a world of rapidly growing global populations, hungry for knowledge and credentials. Furthermore, the expansion of knowledge and fields of research renders increasingly arbitrary our choices about the faculty we hire and the courses we teach. Finally, ready access to the world’s most enticing intellectual capital at little or no cost makes the residential model of the liberal arts feel ever more expensive. With Harvard, Stanford, MIT, and other leading universities putting highly produced courses online — often in fields we don’t even teach — we can be sure that students and their parents will scrutinize intensely the value proposition of the residential liberal arts model. We welcome this scrutiny because it forces us to get very clear about who we are and what we do. It challenges us to make a virtue of our scale, delivering our particular model of education at a high standard of excellence. What is this model? It is the compelling paradox of the liberal arts, where we value the pursuit of knowledge for its own sake, with no practical aim, and at the same time prize the teaching of values — of curiosity and empathy, imagination and confidence — that shape a human being who can in turn shape the world. It is reaching up in pursuit of truth and reaching out in acts of service, and seeing no contradiction between the two. Here I would like to return to the story of Benjamin Mays and suggest three lessons that it offers to the Bates of today. First, the story of Benjamin Mays is a story about “mindset.” It is the story of a college that met the world head on from its very beginnings. Bucking history, convention, and the easy path, Bates engaged with a very complex social reality and pressed ahead based on a simple conviction — namely, that all human beings have free and equal access to God’s grace, and, by extension, to education and human fulfillment. This mindset — standing firmly on principle and encountering the world with energy and confidence — is highly relevant today. If success for colleges and universities was defined for the past thirty years as a niche competition based on wealth and prestige, in the next decades success will go to the institutions that engage most robustly and effectively with the forces that are reshaping our world. It is not enough, in the liberal arts, to circle the wagons and assume that we can keep doing what we’re doing, the way we’ve always been doing it. In a world of exploding knowledge, we need to be highly intentional about how we recruit new faculty and how we configure departments to build on our particular strengths. We need to move beyond the limits of disciplinary structures to shape intellectual capacity and curriculum in ways that respond to the evolution of fields and student curiosity, while at the same time maintaining our standards of excellence. And we need to think pragmatically about how to support faculty members who wish to adapt their pedagogy to take greater advantage of the powerful tools that are now available. With technology turning the world into our library, we must also work with faculty and students to gain access to the range of content and modes of intellectual production that are now at our fingertips. At the same time, the central goal of liberal education — “to nurture the growth of human talent in the service of human freedom,” as historian William Cronon puts it — has never been more important. Given all that our students have coming at them — in the classroom, in their lives, and on their machines — they sorely need adults whom they know and respect to work with them as they learn to navigate complicated intellectual terrain. The good class is not simply the “small” class, but rather the “engaged” class. Here, faculty, through their own passion and erudition, inspire students to take ideas seriously, and sometimes even to love them. They help students when the work gets hard — when texts resist interpretation, or require more context than an eighteen-year-old could possibly bring; when experiments fail in the lab; or when weeks of analysis must be scrubbed because of an error in a data set. Working closely with adults and with each other, students learn that although information may be a click away, mastery and meaning are not. Some kinds of knowledge require patience, and perseverance, and close attention. This is what South African artist William Kentridge calls “getting our hands dirty.” Last spring, Kentridge gave the Norton Lectures at Harvard, and I was privileged to attend all six of them. He titled the series, “Drawing Lessons,” and each week he invited us into his studio — through films, drawings, and reflections — and showed us how the studio is for him the place where he makes sense of the world. For Kentridge, meaning emerges from making. The making of the object is not a one-way translation of an idea into a visual object. Rather, the process of construction is where meaning materializes. From the act of encountering the world and rendering some aspect of it in physical form, we can then look at the object in front of us, and parts of the world and ourselves are revealed. College, like the studio, is quintessentially a place of making — making sense of ourselves and making sense of our world. In this respect, the liberal arts college, with its intimate scale, has a distinct advantage. And Bates has a strong tradition of active, engaged learning to build on. All of our students write senior theses or develop capstone projects, working intensively with a faculty member one-on-one over a period of months. A third of our students work in the local community through their courses or the Harward Center for Community Partnerships. Our General Education Concentrations embrace problem-oriented and interdisciplinary approaches. And over sixty per cent of our students spend some portion of their undergraduate time abroad, quite literally engaged with the world. In short, the mindset exemplified in the Benjamin Mays story is grounded in ideas and values, but porous to the world. For the liberal arts college it means, among other things, recognizing that the line between theory and practice is breaking down. It means acknowledging that our students’ work with Somali children and adults in Lewiston is not only an opportunity for service, but also a venue for cultural learning at a very high level. And it means that we see the growing concern of students and parents with employment prospects not as a domain beneath our proper notice, but rather as a deep aspect of our obligation as a liberal arts college to prepare our students for a life of purposeful work. At our best, we challenge ourselves as an institution to wrestle actively and joyously with the world as we encounter it. In so doing we model this mindset for our students as they work to construct their own lives. It is not our job to supply the answers to these questions, but it is our job to create the conditions under which our students will be inspired to ask them for themselves. Learning here occurs in community. We are situated in a particular place, with a particular culture, and a particular set of human beings who come to know each other face to face. Just as all great novels are parochial novels, so the most complete kind of human learning takes place in community, with the solidarity of companionship and the challenge of truth. The liberal arts college embodies a powerful alchemy of the universal and the particular. The audacity of the intellectual project — to encompass knowledge across time and the world — invites our students to grapple with fundamental principles even as they hone their individuality. At the same time, our intimate scale creates a zone of care and concern that — when it works — produces graduates with ethical awareness and a commitment to serving purposes larger than themselves. Finally, the story of Benjamin Mays is, at the most literal level, a story about community — not only what community is for, but how it is constructed. It is a story of openness and inclusion, well before we had the language for such things. The genius of American higher education is that it unites excellence and opportunity at the heart of the enterprise, allowing talented students regardless of background or means to attend our best colleges and universities, and, conversely, allowing these institutions to draw from broad pools of talent that are constantly being renewed. This is a historical accident brought to us by the G.I. Bill following World War II and codified in the Federal Higher Education Act of 1965. Far from turning American colleges and universities into “hobo jungles,” as predicted in 1944 by University of Chicago President Robert Maynard Hutchins, the returning GIs infused our institutions with talent, energy, aspiration, and grit, producing a higher education system of unmatched vitality and intellectual power. In other words, American higher education is excellent not in spite of its openness, but because of it. At Bates, we claim this union of excellence and opportunity as a core element of our identity, and we need to continue to build on this deep aspect of who we are. As a practical matter this means redoubling our efforts to recruit students from a wide range of backgrounds, and it means maintaining an unwavering commitment to financial aid. A residential liberal arts education is expensive for us to offer and for families to afford. Unless we are content to become a luxury good — higher education’s version of the “gated community” — we must make sure that we have the financial means to seek out and admit talented students regardless of their ability to pay. And we must make equally sure that, once here, our students encounter a diverse range of adults ready to support them for success, and a culture that embraces diversity across many dimensions, giving richness and power to the educational experience of all of our students. Likewise, at Bates, we don’t have time to waste. In certain respects, we lag our peers in wealth and fame and market position. But we are not in danger of living someone else’s life. We know who we are and what we stand for, and we stand ready — together — to challenge ourselves and to engage the world. This inaugural address by Bates President Clayton Spencer, “Questions Worth Asking,” was delivered on Oct. 26, 2012. 1. George Colby Chase, Bates College — Inaugural Address of President George C. Chase, September 22, 1894, p. 8. 2. Clifton Daggett Gray, “Inaugural Address,” Bates College Bulletin, Vol. 18, No. 1 (December 1920), p. 35. 3. Thomas Hedley Reynolds, “The Inaugural Address by Dr. Thomas Hedley Reynolds,” news release, October 7, 1967, pp. 4 and 8. 4. Benjamin E. Mays, Born to Rebel: An Autobiography. Athens, GA: University of Georgia Press, 1987 (c. 1971), p. xliv. 9. L. Rafael Reif, Inaugural Address, Office of the President, Massachusetts Institute of Technology, September, 21, 2012, http://president.mit.edu/speeches-writing/inaugural-address. 14. Reynolds Inaugural Address, p. 1. 15. Alfred Williams Anthony, Bates College and Its Background: A Review of Origins and Causes. Philadelphia: Judson Press, 1936, pp. 81-82. See also, Charles E. Clark, Bates Through the Years: An Illustrated History. Lewiston, ME: Bates College, 2005, p. 20. 16. William Cronon, “‘Only Connect…’: The Goals of a Liberal Education,” The American Scholar, Volume 67, No. 4 (Autumn 1998), retrieved from http://www.williamcronon.net/writing/Cronon_Only_Connect.pdf. 18. Peter Gomes, Never Give Up! And Other Sermons Preached at Harvard, 2008–2010, ed. Cynthia Wight Rossano (Cambridge: Memorial Church, Harvard University, 2011) p. 21. 19. Karen Campbell, “Answering deep questions — there’s not an app for that,” interview with Howard Gardner, The Boston Globe, October 8, 2012, p. G14. 21. Ian McEwan, “The Lever: Where Novelists Stand to Move the World,” (lecture, Harvard University, April 17, 2012). 22. See, for example, Patricia Strach, “Making Higher Education Affordable: Policy Design in Postwar America,” Journal of Policy History, Vol. 21, No. 1 (January 2009), pp. 61-88 (esp. pp. 65-67 and notes 19-28). 23. Robert Maynard Hutchins, “The Threat to American Education,” Collier’s, December 30, 1944, pp. 20-21. 24. “‘You’ve got to find what you love,’ Jobs says,” Stanford Report, June 14, 2005, http://news.stanford.edu/news/2005/june15/jobs-061505.html.